The Model 6600 provides precision phase measurements with a typical accuracy of 0.1° and 0.1° resolution over most of the frequency range. It will accept a wide range of input signal levels from 10mV rms to 320V rms and input waveforms including sine, triangle, square and pulses. A 4 digit, LED display provides continuous direct readout of phase angles between 0.0° and 360.0°. Two common factors will affect the accuracy of a phasemeter are distortion and/or broadband noise present on either or both of the input signals. A unique circuit design used in the 6600 significantly reduces any effects that may be caused by these two factors. Another problem found in most phasemeters is the inability to respond to very small phase angles, resulting in fluctuations or inconsistencies in the meter reading (sometimes referred to as ambiguity). To overcome this problem, the 6600 uses a design that eliminates any ambiguities that may occur at readings near 0°, 180° and 360°. 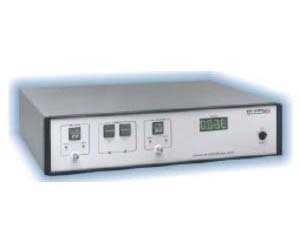 Provided are an automatic selection of the input voltage range, front panel indicators to indicate a too low/high input voltage range, and an analog output for use with an external meter or strip chart recorder. Part no. RK-316 permits the installation of the Model 6600 into a standard 19" rack spacing.